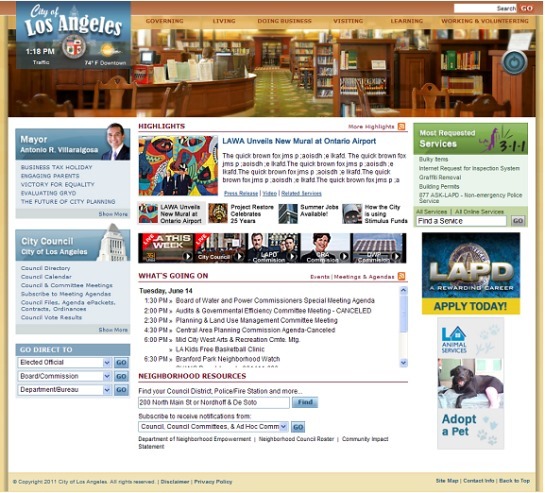 As the entertainment capital of the world, and the second largest city in the United States, Los Angeles, CA wants their city website, LACity.org, to reflect the creativity of the area while delivering critical city services in an easy to use and visually compelling portal. 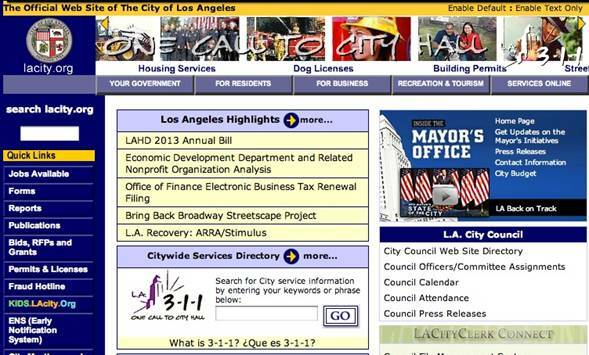 LACity.org started out as an online directory in 1995 and was revised in 1998 to be more service-oriented with the creation of the 3-1-1 Call Center, (Citywide Services Directory) and as a step in beginning the deployment of e-government online transactions. Since then, the City has increased the use of the internet to share information by creating Department and Elected Officials websites and expanded self-service opportunities to the public through online services applications. 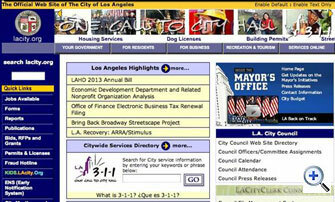 However, LACity.org had not been updated to provide users any easy and centralized way to find this information. Low website usage reflected this reality and Human Factors International (HFI) was engaged to enliven the site’s experience. ITA and the City of LA looked to HFI to perform website usability testing and evaluation that would help the City of Los Angeles improve the overall usability, accessibility, readability, organization, and design of the official website LACity.org. An HFI Expert Review of the LACity.org prototype website using research-based and best-practice guidelines provided insight into the site’s effectiveness and accessibility. It identified the design elements that enhance the visitor’s user experience and those areas where potential obstacles could be removed. Usability testing provided two components. First, it provided a baseline dataset that can be used for comparison and future usability testing. Second, it provided an objective view into how real users would use the site. Through HFI’s verification, areas of the site that are successful were leveraged and less successful design and presentation elements were redesigned and/or documented to be improved in future phases of work. HFI mapped out a UX Strategy for LACity.org and the methodology for going forward. Good user experience methodology will continue to help the LACity website team create effective and valuable web content and be a key resource for the city. 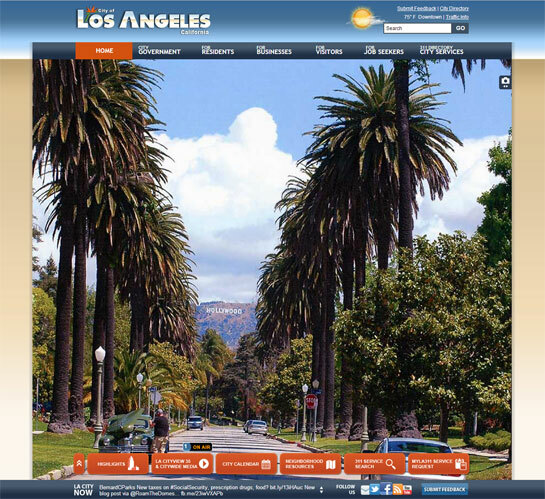 The new LACity.org website reflects the creativity and dynamic nature of the region. It has an engaging look and feel and is now smart, open, and social. Smart: The new LACityorg offers a smarter user experience with self-updating “Top 10 Service Requests,” “Top 10 City Council Files,” and a “Dynamic City Calendar.” Visitors can make payments, request services, and more, any time of the day, 24/7, from anywhere. Open: The citizen-centric redesign features live streaming home screen video, centralized job opportunities, and easy to access City services. Visitors can stay updated with live and on-demand videos provided by LA CityView 35 including live coverage of City Council meetings and the weekly news show, LA This Week. Social: The site provides a more social user experience through “LA City Now,” a homepage ticker-tape of every City twitter feed. Visitors can also follow Twitter, Facebook, LinkedIn and other social media feeds for city officials and departments—all easy to find on the social media directory. 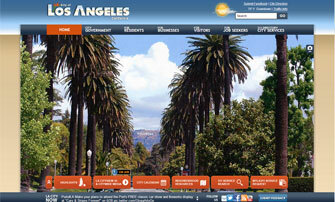 ITA General Manager Steve Reneker said, “The City of LA has re-imaged its online presence. Our new site features richer content, social media connectivity, and online 311 services. 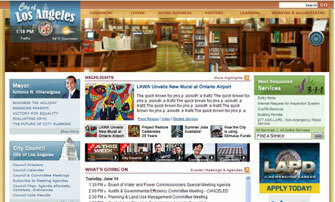 I’m proud to say that we’ve built one of the best city websites in the country. Website usability was top priority for the redesign to be a success. The greatest amount of effort and focus was placed on the design and usability testing phases of the project and HFI provided great help and guidance with that."